← LOVING THE GIFT OR THE GIFT-GIVER? In 1940 President Franklin Roosevelt signed the Selective Training and Service Act, which established our country’s first peacetime draft. From 1948 until 1973, during periods of both war and peacetime, men were drafted into our armed forces to fill vacancies that were not being filled through voluntary means. The draft was shut down in 1973 when the U.S. went to an all-volunteer military. The Gadites and Reubenites were content to stay on the east side of the Jordan because the land there was suitable for their herds and livestock. But Moses reminded them that they had a duty to serve alongside of the rest of God’s people in conquering the land God had given them. Moses made it clear that, regardless of where they chose to settle, they were part of a bigger community. They needed to look beyond their own desires to their duty, because they were part of a family of faith. What was true for the Gadites and the Reubenites then is true for every Christian today. With privilege comes responsibility; we have a divine duty to our family of faith. When God raised us from life to death, He drafted us into His Almighty Army. 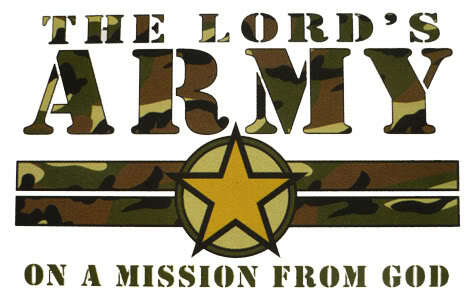 God’s divine draft has brought us into His Almighty Army to stand our post and answer our call to expand the cause of the kingdom of Christ, regardless of the cost or circumstance. God forbid that we should make it our greatest goal in this life to live at ease in Zion! Yet far too many in the church today live a life of self-protection rather than self-sacrifice. Their primary concern is expanding the cause of their little kingdom, accomplishing their little goals, and setting forth their little agendas. To this kind of life you and I must say NO! We must willingly engage in the battle God has brought us into. You see, there was no battle before Jesus showed up. We were happily living for the self. But when Jesus raised us from death to life and became our new Ruler and King, we were drafted to discipline ourselves in the service of our Savior. Having been drafted by Divinity, we find ourselves called to the front lines of faith to take sword to our enemies—the world, the flesh, and the devil—knowing that Jesus has already won the war on our behalf. We need only fight the daily skirmishes that come our way in His strength . . . knowing that He who drafted us will surely deliver us. After all, we have His Word on it!